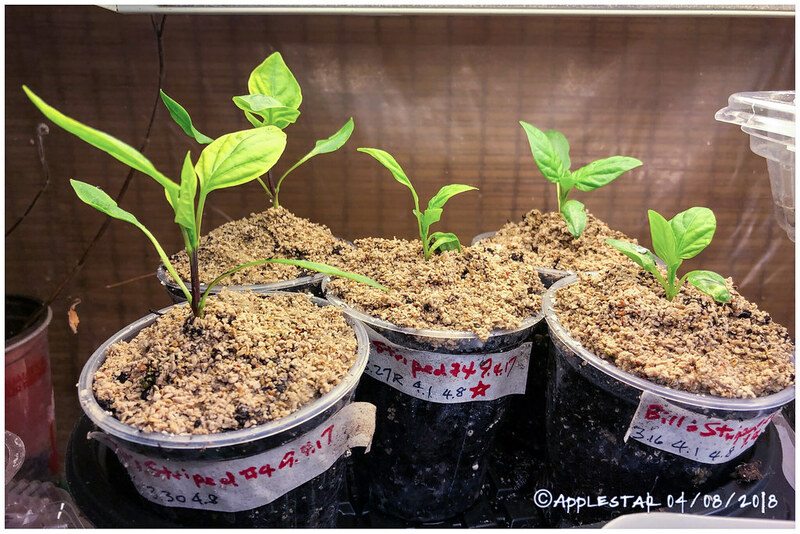 This year, I’m growing a special project variety called Bill’s Striped sweet pepper. It’s an as yet unreleased, sweet, sometimes pointy thickwalled bell-like pepper with rare striped fruits in the green stage that ripens red. My understanding is that as the fruit color gets darker, the striping could become harder to see. I now have eight (8) Bill’s Striped seedlings “from the #4 plant”, individually potted in tiny-small containers. (They are not all in these photos — the others have been moved off the heat mat). ... you can see how the cotyledons are folded upward. I was intrigued/concerned that they seemed to be stuck together, so yesterday, I sprayed the leaves well, then tried to ease them apart... and found out they are actually stuck together — fused — I ended up tearing part of the fused leaves before realizing. Today, there is a tiny true leaf pair starting to push their way out sideways to grow from the base of the fused cotyledons. This is almost exactly what happens when the very tip of seedleaves are stubbornly stuck in helmethead/seedcoat but the seedling is otherwise healthy. I investigated further and found two more Bill’s Striped seedlings doing the same thing. ...so .. 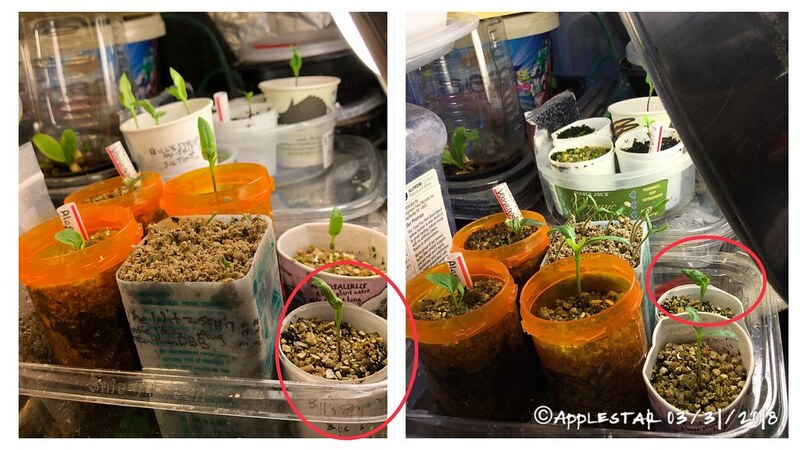 I think these will grow out of this phase once the true leaves grow and eventually drop the cotyledons — but I’ve asked the project group if I should cull them. ...What do the members here think? Also, have you encountered seedlings like these or any other notable defects? I've not seen them stick together without the seed coats still on - that's really strange! I always cull things like that out, assuming that there are enough of them, otherwise, if it's something I didn't have many seeds of, I just leave them, and see if it results in a stunted seedling later on. Hopefully not, but if so, I always have excess of something else to take its place. But since it's a special project you are working on, maybe separate any that did that, and make a note on them, so you can see if it has any result on the plant once they are in the garden. I have often had seedlings with cotyledons stuck in the seed coat and a number of times trying to free them has resulted in tearing the tips of the leaves off. It never seems to slow the seedling development down any. You could just clip the fused parts off. ...One of the two fused seedlings started to push the seedleaves away from each other, and when I gently tugged, they came apart. The other fused cotyledons seedlings is in the middle. It might be slightly delayed compared to others?